They say that relationships are made or broken when you go on holiday together. This is the situation that Maggie finds herself in when she and boyfriend Leo go on a group skiing holiday to Meribel. Whilst Maggie knows her relationship with Leo isn’t perfect she does not expect to see how bad things have gotten. Things go from bad to worse when Maggie embarks on an innocent flirtation with hunky ski instructor Sylvan. Can Maggie and Leo repair their relationship before it is too late? 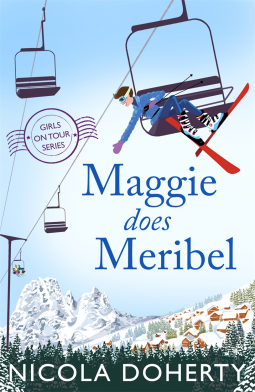 Maggie Does Meribel has been my favourite of the Girls on Tour series of books. What Nicola Doherty has managed to do (and do very well) is create a realistic story about the pitfalls of any relationship. The way she describes Maggie’s insecurity about rocking the boat when it is damn obvious that Leo is being horrible to her is such an honest account. Haven’t we all felt like that sometimes? This was especially clever by being juxtaposed with the two other relationships within the story. They showed us, the reader, and Maggie exactly what she was missing. I think Nicola Doherty has created such a wonderful series of books and each one has its own merits. With Maggie Does Meribel it is the anti-love story that makes it so special. Another massive well done to Nicola Doherty. Maggie Does Meribel by Nicola Doherty is available now. You can follow Nicola Doherty (@nicoladoherty_) on Twitter.